The Jesuit Conference of Nursing Programs (JCNP) is a collaborative and supportive consortium that promotes a Catholic, Jesuit nursing identity to advance nursing education and improve health. 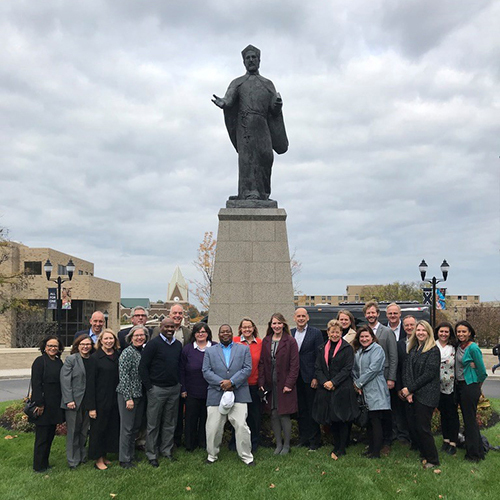 JCNP members are a highly engaged team of administrators, at least half of whom are participants or graduates of the Ignatian Colleagues Program [ICP]. Current JCNP initiatives include: 1) engaging Jesuit deans in leadership positions of national and state nursing organizations to bring Jesuit leadership values to a broader audience; and, 2) developing a collaborative consortium to build capacity for access to doctoral education at Jesuit schools of nursing. Both initiatives are progressing well. JCNP members value collaborative opportunities to share best practices, seek consultation, deepen friendships, and plan for greater impact as a group and at their institutions. JCNP uses structure and goal-setting to provide meaning in members' work together. On October 25, 2011, JCNP members met in Washington, DC to discuss the Strategic Map: 2012 – 2015, which features a mission, vision and action steps: Click here to download the map as a PDF. The JCNP currently sponsors faculty get-togethers at national conferences where nursing faculty are in attendance; has a collective website hosted by Regis where program and accreditation materials are stored; and holds a planning retreat every other year. JCNP members may access materials related to their work on a password-protected page; click here to access it online.